The West-Coast Led Zeppelin Powerhouse hits New Orleans April 22! Don't Miss It! cleopatrick is a heavy alt-rock duo from the tiny town of Cobourg, Ontario - yup, the ‘c’ is lowercase. Best friends since kindergarten, frontman Luke Gruntz and drummer Ian Fraser have an enviable connection that translates into a powerfully unified expression of sound. With a bastardized bass amp and split signal, Gruntz simultaneously commands the range of bass and guitar topped with provocative blues grooves and take-down breakdowns. In early 2016, the pair recorded their first EP 14 in its entirety in a single studio session and was later dubbed one of the most promising acts for 2017 by 94.9 The Rock’s “Generation Next” program. Now piling all of the torment and rhetoric of chasing big dreams within the limits of a small town, cleopatrick’s brand new single “hometown” gives a tasteful hint of growth and raw revelation expressed in their upcoming sophomore EP the boys (Fall 2018). Mystery Zone returns to Decatur St.
18+ AGES - UNDER 21 must pay $5 surcharge at the door. We will announce the lineup soon! Post French Quarter Fest with Gal Holiday! Slim Cessna, Munly J Munly, Lord Dwight and Rebecca Vera. Norman performs an instrumental sound track/ soundscape set thru guitar and the other original & active member of Swans besides Michael Gira. Germain Bigou aka Moresounds is a French musician from Paris, France. Having begun his career in the early 2000s, Bigou is now a recognised actor in the global drum & bass scene, a dance music genre with roots in England. After years of small independent releases, his first notable professional releases came via the UK label Cosmic Bridge in 2012 followed by the Astrophonica label, also UK-based. Since then he has received further recognition and support from noted drum & bass pioneer Doc Scott, who released Bigou's productions on his own label, J:Kenzo, and with remixes for US producer Machinedrum's Vapor City project on the Ninja Tune label. Recognising his progress, FACT Magazine included Bigou as a producer to watch in 2015. Bigou's music has appeared regularly on UK radio stations including BBC Radio 1 and Rinse FM, as well as various radio shows around the world. He has performed live, in a unique dub style rooted in Jamaican tradition, in various European cities, as well as China. He has appeared at noted festivals such as Sun & Bass (Italy), Fusion (Germany), and Telerama Dub (France). "Moresounds is a proud student of Tubby, a man who found his artistic voice not only in the echoes of the Kingston pioneer's legacy but also the grooves of hip hop and the psychedelia of rave and dance music. Moresounds' music is that rare thing: a real synthesis of dub and dance music aesthetics, pulling from the enduring, mutating DNA strands of each to create something that's beyond a mere mixture of styles. This intricate synthesis was first showcased to the world via releases on Seattle's Car Crash Set, the Snafu EP, and Om Unit's Cosmic Bridge label, the Control Breath EP. The latter has received worldwide praise and continued support from the likes of Low End Theory's D-Styles and legendary selector David Rodigan while also catching the attention Astrophonica boss Fracture. Soon enough a deal was sealed for Moresounds to follow Control Breath with a self-titled EP for the London label." '80s into '90s and beyond of dark underground obscurities and classics. Scandals from Dallas TX and Some Kind of Nightmare from San Diego CA are both on tour hitting Nola at Santos with killer locals Diplocrats and the Legendary Pallbearers!! Andrew Duhon is a songwriter who's weighted, soulful songs feel like a sweet spot between his hometown of New Orleans and the familiar landmarks of Americana Music. No Depression call's Duhon "A soulmate of Van Morrison lyrically and vocally." He followed his 2013 Grammy Nominated album, "The Moorings," with a new record released this past May called "False River.” Duhon brings his trio for whats sure to be a night of songs that move you and music that’ll make you move. 21+ 6pm $13 Adv. Tix - CLICK BELOW! SIN specials and Unicorn FUKR. Bass Church (aka Church*) is the home for underground dance music and sound system culture in NOLA. Named one of the top 20 parties in America by DJ Mag, it is also New Orleans' original underground dubstep and bass music weekly and the longest running electronic dance music weekly in Louisiana and the Gulf Coast region. Founded in 2010, Church* took place every Sunday night at the legendary Dragon's Den. In 2017, Church* hit the road for The Missionary Tour and the event took place in cities all around America including New York City, Detroit, Denver, Atlanta, St Louis and more. After 8 years on Sundays, and after bringing back it's original namesake, Bass Church* now takes place every Saturday night at Santos Bar (1135 Decatur) in the French Quarter. Bass Church* features a wide spectrum of underground electronic dance music including bass music, dubstep, grime, drum & bass, jungle, uk garage, juke/footwork, trap, glitch hop and everything in between. It focuses on the underground cutting-edge, innovative and forward-thinking side of dance music. 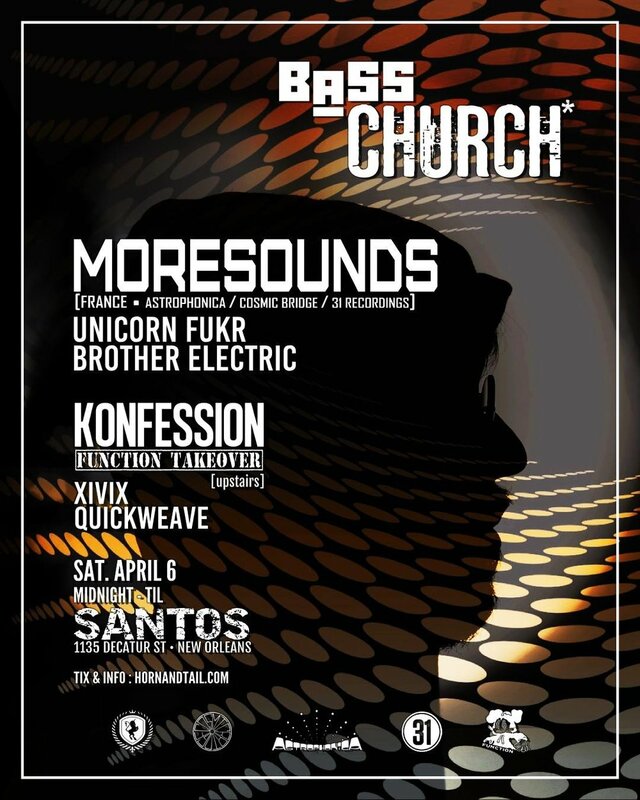 With it's sister party KOMPRESSION, Bass Church* also features house & techno in the 2nd room under the name Konfession. With its origins rooted in dubstep and UK soundsystem culture and its forward-thinking approach to showcasing both the history and the future in the evolution of dance music, Bass Church* regularly hosts special guests from all over the world, often legends, pioneers, innovators and champions of their respective genres and areas of dance music -- such as Digital Mystikz (Mala & Coki), LTJ Bukem, Loefah, Hatcha, Youngsta, Roni Size, Kode9, Goth-Trad, Truth, Joe Nice, Doc Scott, Ivy Lab, EPROM, Jimmy Edgar, Machinedrum, Om Unit, Scuba, DJ Shiftee, Stanton Warriors, the Dirtybird crew (Justin Martin, Christian Martin, J.Phlip, Worthy) and many many MANY more! Aside from the international, national and regional guest artists, the underground sounds are provided every week by Bass Church* co-founder Unicorn Fukr, host MC Werd2Jah, and a rotating cast of resident DJs: Rekanize, Innerlign, Rus, Beverly Skillz, Carmine P. Filthy, Brother Electric, Herb Jr (aka C-Lab) and Jaek plus Konfession resident Herb Christopher (KOMPRESSION co-founder). Former residents include Mr Cool Bad Guy (Bass Church* co-founder), Boogie T., Shanook, Kidd Love, RMonic & Zander. Join the NOLA underground dance music community every weekend in worshipping the low-end! Stonecutters return to Santos to rip your face off! Special guests Romasa & Witch Burial.